The major question that this project aimed to address is whether permanently irregular structures produced by selection fellings can be created with oak and ash and what the transformation process and the developed structures would look like. The aim of the first part of the project was to begin the establishment of a series of research stands that will produce information on stand structure and stand performance in terms of timber increment. There are few examples of systematically managed, irregular stands of these species in the UK, but a range of stands on the Melbury Estate in northwest Dorset have been subject to interventions over the last 10 years. These are designed to move towards a structure towards a structure likely to achieve permanent irregularity. Seven stands at Melbury were completely enumerated using the Check Method for the first time in winter 2003/4. Part 2 of the project considered the silviculture of continuous cover oak/ash stands in detail in the light of recent experience and research in France. In the late 1980s several pioneering private forest managers in France began to adopt continuous cover forest management principles in the silviculture of broadleaved stands where oak was the dominant, or at least major stand component. Since then the application of these techniques has spread within the private sector and more recently in communally owned woodlands managed by the ONF, the state forest service. Parallel with this, a major research project has been developed by the Association Futaie Irrégulière (AFI), a group of private managers and owners, in association with the ENGREF, the leading forestry university and forest research centre in France based at Nancy. This project has established, since 1991, a network of research stands located within broadleaved forests with well-developed structures throughout eastern and northern France. A tour was undertaken in September 2005 of a number of these research stands organised and hosted by Max Bruciamacchie and Julien Tomasini, the scientific adviser and secretary of the AFI respectively and both academics at the ENGREF. This visit coincided with the publication of the second AFI report providing a synthesis of results from the AFI Research Network over the period 1991 to 2005. This approach has already been very successful and the publication contains a wealth of major insights into the silviculture of irregular broadleaved woodland. A Report of Part 2 of the Project has been produced which considers the results of this research and its relevance to lowland England, and particularly to central southern and southwest England. The report further looks at the methodology of the AFI Network and considers whether a similar network might be extended to central and southwest England. This report is available from Woodland Heritage or will be available to download from www.selectfor.com in the near future. The Part 1 Report is already available at this location. The first major conclusion to be drawn from the French experience, as chronicled by the AFI, is that selection systems can be successfully applied to a wide range of broadleaved species, including oak and ash, and across a wide range of site types in different climatic regions. Stand structures that deliver favourable light conditions for regeneration, recruitment of saplings into the main stand and the development and sustension of large trees are well demonstrated across the AFI Network and were seen at first hand in the five stands visited in eastern and north eastern France. A growing stock of the appropriate size; this will be in the region of half that of a fully-stocked, mature even-aged stand. An appropriate balance between small, medium and large diameter trees. A deer population in reasonable balance with available food resources. With regard to the perceived problem of oak regeneration under selection systems, in all the more developed stands oak regeneration was occurring without major problems. The second major conclusion is that management directly focused on the production of high quality hardwood timber is compatible with permanently irregular, selection stands. The managers and owners of the forests within the AFI Network are very focused on the production of quality timber. Silviculture aims at concentrating the timber increment onto the best quality stems and at the production of a supply of high quality poles and small trees to sustain the population of quality stems in the main stand. Their view is that growing trees under the diffuse light conditions which pertain in these rather open selection stands is the most effective way of achieving high quality timber production on sites with reasonable existing genetic resources of the target species. Their radical view is that poor form in broadleaves is often partly due to the effect of too much direct overhead light rather than genetic variation and lack of side competition. The third major conclusion is that setting up long term monitoring of well-managed stands, similar to the AFI methodology, produces a very valuable source of practical information which can quite quickly begin to provide key insights into the application of these techniques and are able to define good practice across a wide range of species and sites. The AFI Network is also producing a large amount of economic data, analysed in innovative ways. This has been outside the scope of the report to describe, but the results have already provided similar insights and overviews of the financial characteristics of CCF stands. This is real data based on real timber revenues and real costs of silviculture and management. A striking, simple, statistic is that all 61 reference stands have made a profit over the whole period of study to date. In applying the research and practice from the AFI Network to southern English broadleaved stands we should consider the differences between the two locations: climatically, north western France is not dissimilar to south-west England, but in eastern France light conditions and the degree of summer moisture deficit will differ somewhat from southern English conditions. The existing stand structure of southern English stands is also often different from the French stands. The differences in the structure of the understorey, particularly the dominance of hazel in southern England, is important silviculturally and the fact that many English stands have a high stocking of large trees will result in a different kind of transformation, often with a longer time period, in the English stands. Finally the scale of woodlands in the two regions is different. In eastern France the broadleaved forests are large, blocks of 500-1000 ha are not unusual and are more homogeneous than in the UK. 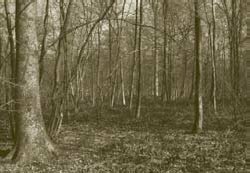 They have not suffered from either the neglect, or the drastic changes which have often left larger woods in England as a mosaic of relic, overstocked broadleaved stands amongst plantations of exotic species. The similarities are such, however, that we can draw some initial lessons for current practice of Continuous Cover Forest management in southern England and these are detailed in the Report. In conclusion, the AFI Research Network has demonstrated that by quantifying, describing and sharing good, effective practice across the widest possible range of situations one can provide detailed insights into the effects of different species composition, stand development and site type. Also the French experience suggests that there is no silvicultural reason why continuous cover forest management cannot be applied to lowland England and the experience on the Melbury estate is beginning to corroborate this contention. The challenges lie in the small-scale and fragmented nature of our broadleaved resource and in the poor infrastructure, both practical in terms of access, and in terms of human resources with a sharply declining contractor base. There are sufficient differences between the French stands and their English counterparts for it to be worthwhile to establish a similar research stand network to that of the AFI in Britain. Although this might begin in southern England, in order to maximise the comparison with the French network, it would be valuable to extend it into the rest of Britain and in Ireland, as more sites travel further down the road of transformation to permanently irregular structures. The wealth of practical silvicultural information and the confidence that is derived from comparing and contrasting different experience would be invaluable to the development of continuous cover forest management in Britain. Older PostGreek Hardwood Utilisation: What techniques could be transferred to UK markets?